1. Nothing spoils the taste of peanut butter like unrequited love. 2. There must be millions of people all over the world who never get any love letters . . . I could be their leader. 3. Happiness is anyone and anything that’s loved by you. 4. All you need is love. But a little chocolate now and then doesn’t hurt. 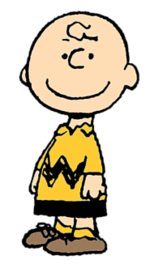 Excerpt from Wikipedia: Charles “Charlie” Brown is the main protagonist in the comic strip Peanuts by Charles M. Schulz. 1. In the book of life, the answers aren’t in the back. 2. I just laughed about it, … I just thought if you’re going to align yourself with somebody, it might as well be champions. He made his own decisions, not doing something just because you have to do it. He had his own sense of purpose. 4. Stop worrying about the world ending today. It’s already tomorrow in Australia. 5. I think I’m afraid of being happy because whenever I get too happy something bad always happens. 6. Learn from yesterday, live for today, look to tomorrow, rest this afternoon.